FACT CHECK: Freddie Gray Had Spinal Surgery? Freddie Gray Had Spinal Surgery? Rumor: Freddie Gray was injured in a car accident and underwent spinal surgery prior to his arrest and death. Claim: Freddie Gray was injured in a car accident and underwent spinal surgery prior to his arrest and death. Freddy Gray had a pre-existing spinal and neck injury and had severe damage and scar tissue from an accident that Allstate Insurance was paying him a large structured settlement. Freddy had several unsuccessful spinal fusion surgeries, he most recent spinal/cervical operation was a week and a half before he was arrested. Freddy should have been at home in bed resting and recovering from recent major operation instead of manufacturing and distributing drugs on the streets and resisting arrest. Freddy has a criminal record pages long for manufacturing and distributing controlled dangerous drugs that were cocaine crack heroine etc. along with many assault charges, gun charges, breaking and entering and the list goes on since he was 18 years old. (Juvenile records are sealed.) Look at some of this on www.mdjudiciarycasesearch. You will also see where he was trying to cash in his monthly structured settlement for his spinal injury payments to one lump sum through Peachtree Funding, He could have easily fallen in the paddy wagon from the slippery bench to the floor or twisted his fused spine to reopen his recently fused damaged spine. Also, the police that arrested him were also black, not white. Why are people destroying their own homes and revenue when they don’t know the whole story? Mostly because it’s a good reason and timing to loot and get new shoes and stolen goods? You got it! None of the police officers that arrested Freddy had a history of police brutality. Freddy was a dangerous career felon with a damaged spine and neck that was supposed to be healing a week and a half after surgery, not running the streets committing felonies and resisting arrest. Origins: On 28 April 2015, the city of Baltimore was beset by demonstrations (some violent) following the April 2015 death of resident Freddie Gray from spinal injuries while he was in the custody of police. Gray, 25, was the subject of multiple rumors amid the unrest, among them that Gray had an existing spinal injury as the result of earlier car accident (for which he had received a substantial insurance settlement). That rumor appeared almost simultaneously in three places: The Facebook page of Baltimore-based Fox affilate WBFF, the Conservative Treehouse blog, and the Fourth Estate blog. 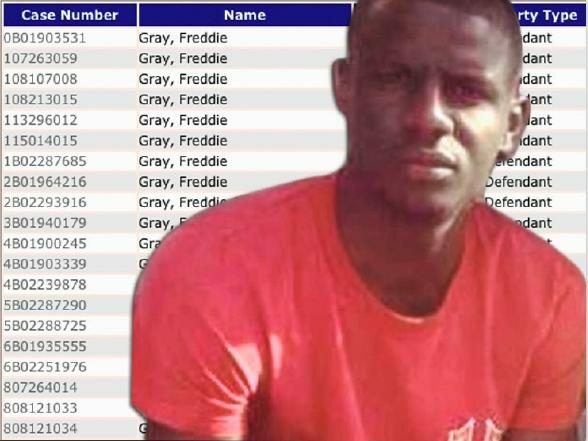 EXCLUSIVE: The Fourth Estate has learned that Freddie Gray’s life-ending injuries to his spine may have possibly been the result of spinal and neck surgery that he allegedly received a week before he was arrested, not from rough excessively rough treatment or abuse from police. The Fourth Estate has contacted sources who allege that Freddie Gray received spinal and neck surgery a week before we was arrested, and was allegedly receiving a large structured settlement from Allstate Insurance. The surgery is allegedly related to a car accident in which Gray was involved. Court records examined by the Baltimore Sun show the case had nothing to do with a car accident or a spine injury. Instead, they are connected to a lawsuit alleging that Gray and his sister were injured by exposure lead paint. As children, [Gray] and his two sisters were found to have damaging lead levels in their blood, which led to multiple educational, behavioral and medical problems, according to a lawsuit they filed in 2008 against the owner of a Sandtown-Winchester home they rented for four years. While the property owner countered in the suit that other factors could have contributed to the children’s deficits — poverty, frequent moves and their mother’s drug use, for example — the case was settled before going to trial in 2010. The terms of the settlement are not public. Paperwork was filed in December  allowing Gray and his sister, Fredericka to each collect an $18,000 payment from Peachtree Settlement Funding, records show. In exchange, Peachtree would have received a $108,439 annuity that was scheduled to be paid in $602 monthly installments between 2024 and 2039. 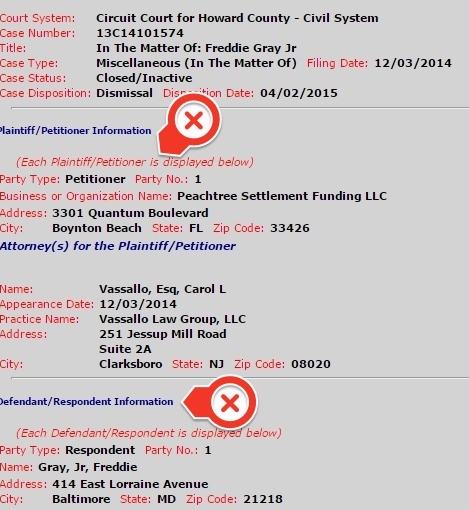 There is certainly more than one individual with the name “Freddie Gray” in the state of Maryland, with at least one case in the database involving a divorce that took place while Gray was very young. How many of those cases might have involved the man who died in police custody is uncertain, as is how the additional information attached to this rumor that is not evident from court database listings (e.g., that Gray suffered a spinal injury in an automobile accident) might have been substantiated. The Baltimore Sun. 29 April 2015.